The 26th annual Images Festival will be taking over Toronto on April 11-20 with an epic series of experimental film screenings, media installations, expanded cinema performances, workshops, artist talks and tons more. With so much going on, the Underground Film Journal is just listing all the screening events below. 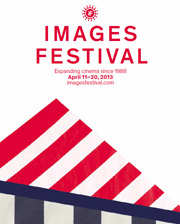 For everything Images has to offer, please visit their official website. Opening Night: Accompanying the documentary imagery of prolific filmmaker Robert Todd will be live music performed by electronic music deconstructionist Tim Hecker. Plus, there will be a new audiovisual work by SlowPitch called Emoralis, which pairs images of snails with crackly and droning rhythms. Closing Night: Corredor will be a live performance piece combining South American imagery by artist Alexandra Gelis, accompanied by live music by drummer Hamid Drake and saxophonist David Mott. Live Performances: Jodie Mack will provide live vocals of her latest animated rock opera, Dusty Stacks of Mom, which chronicles the fall of her mother’s poster business; while Film: Rope will be a performance recreation of Alfred Hitchcock’s groundbreaking film Rope. Films: Beautiful People is a newly restored version of the late David Wojnarowicz’s 1987 underground film; Lynne Sachs‘ hybrid Chinese worker documentary Your Day Is My Night; and Adele Horne‘s Maintenance, a meditation on home cleaning. Also, there will be short film retrospectives of Althea Thauberger and Babette Mangolte; and new short work by Jesse McLean, Leslie Supnet, Clint Enns, Georg Koszulinski and more. Live images by Robert Todd. Live sounds by Tim Hecker and SlowPitch. 9:00 p.m.: Suitcase of Love and Shame, dir. Jane Gillooly. Constructed from an accidentally uncovered reel-to-reel audiotape, two lovers make their way through the sexual revolution. 6:00 p.m.: Leaf in the Wind, dir. Jean-Marie Teno. This documentary profiles Ernest Ouandie, a Cameroonian freedom fighter who was executed in 1971, and his daughter Ernestine, who committed suicide in 2009. 9:00 p.m.: Lukas nino (Lukas the Strange), dir. John Torres. A young boy copes with the disappearance of his father, who is rumored to be half-man, half-horse. 7:00 p.m.: Film: Rope, dir. Francesco Gagliardi. This live performance will recreate Alfred Hitchcock’s groundbreaking Rope. 9:00 p.m.: Beautiful People, dir. David Wojnarowicz. The classic 1987 underground film by the late Wojnarowicz, followed by a conversation about his work led by Jesse Hultberg and Don Pyle. 9:00 p.m.: Maintenance, dir. Adele Horne. A meditation on house cleaning. 6:30 p.m.: Your Day Is My Night, dir. Lynne Sachs. A hybrid documentary covering the stories told in a Chinatown “shift-bed” apartment, as told through dreams, movement and song. 10:30 p.m.: Dusty Stacks of Mom: The Poster Project, dir. Jodie Mack. This animated rock opera charts the fall of Mack’s mother’s poster business. Featuring live vocals by Mack. Bring your short films under 10 mins. long. Formats accepted: 16mm, Super8, video (on DVD, or Quicktime file on disc or flash drive). 4:00 p.m.: grain(s), dir. Duane Linklater, Tanya Lukin Linklater. A new live performance based on Robert Flaherty’s Nanook of the North (1922) and Hiroshi Teshigahara’s The Woman in the Dunes (1964). Images by Alexandra Gelis. Live music by Hamid Drake and David Mott.